My husband (Brooks) loves to build things, and is excited to think of when our son Archer gets to the age that they can build things together. We were pretty excited to try out the Max Flex 300 RC Glow In The Dark Flexible Track System that Skullduggery sent us. Archer is only 3, and so he might be a little young to fully understand how to race properly, but Brooks and I are competitive and so we had a lot of fun racing each other. 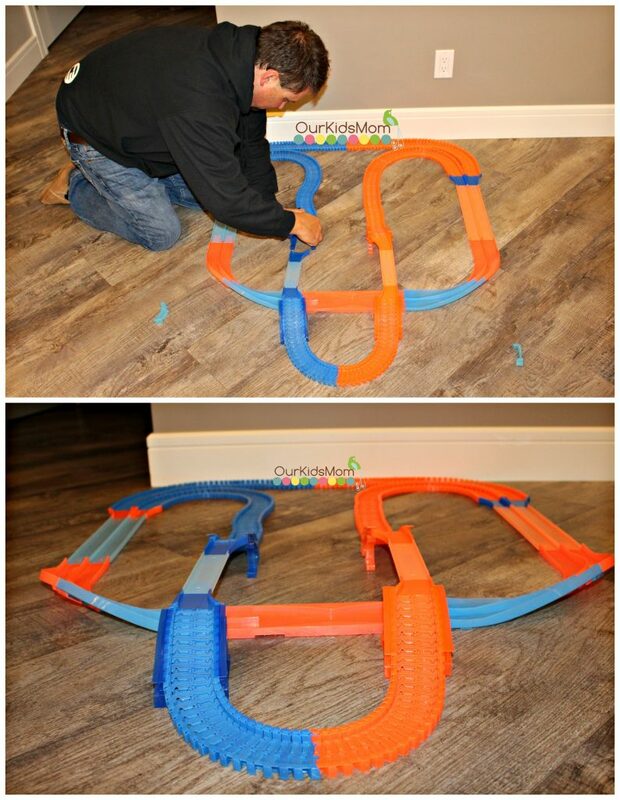 We found that it was really simple to put together, and with over 25 feet of flexible track, the designing options are truly endless. 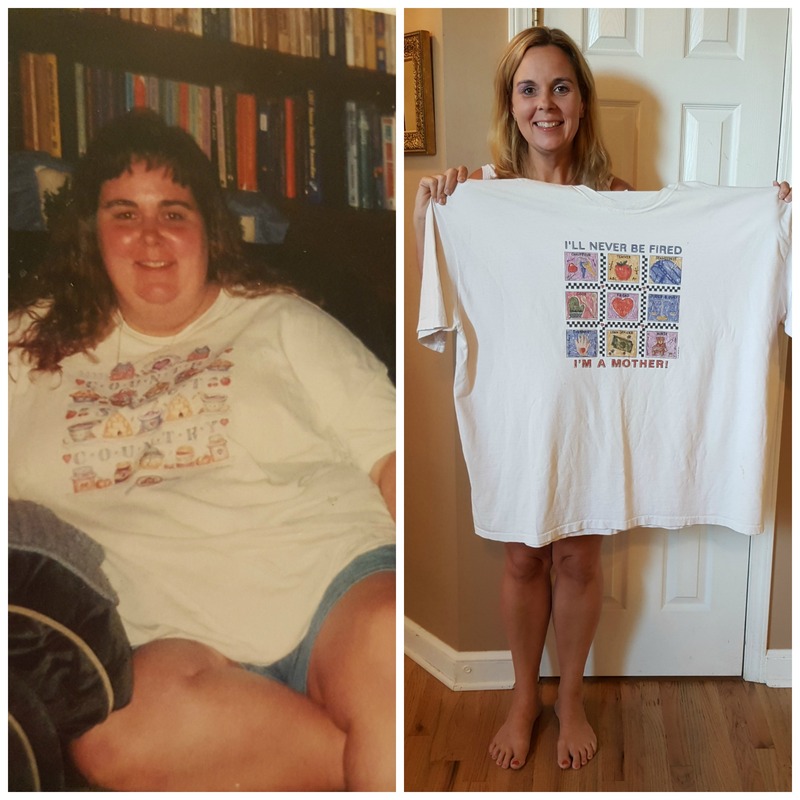 We decided to build it like the picture on the box to start, and then could change any part of it, and found that it is very versatile. 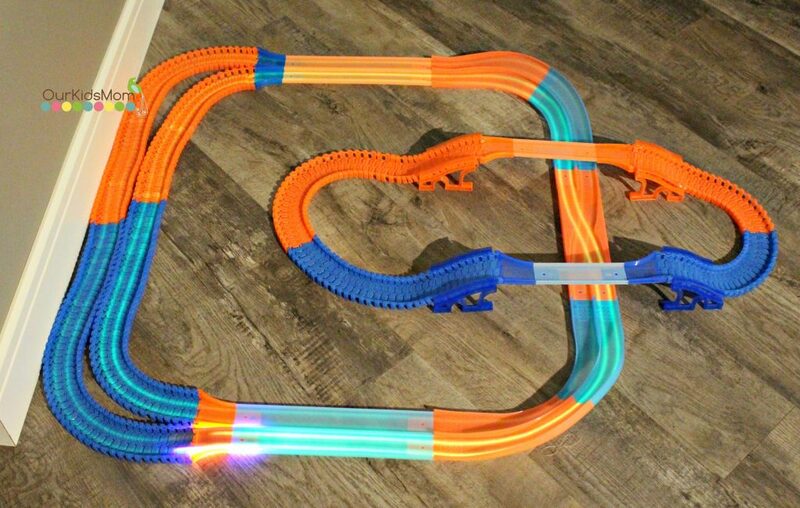 It comes with two adapter pieces that allow the track to connect to other brands of flexible track, which is a great option. After we had built the track, we noticed that we needed to charge the cars. Charging the cars was very easy, as the remote is also the charger for the cars, and each remote takes 4 AA battery that I fortunately happened to have on hand. There is a tiny cord that comes out of the top of the remote, and plugs into the bottom of the car. There are indicator lights on the remote that show you when the car is fully charged. The car can also click onto the remote during charging, or for storage. The charging didn’t take long at all, and one charge lasted quite a while. The remotes and cars are color coordinated, so it is easy to keep track of which car is yours. 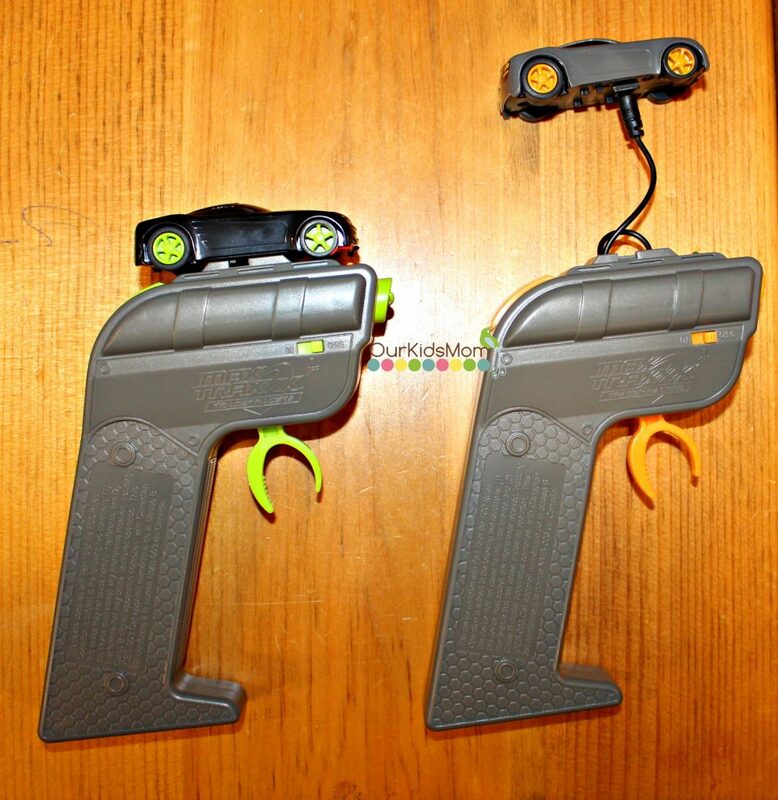 As we were racing, we found that it was so easy to change the speed of the cars, as it all depends on the pressure you place on the trigger of the remote, and I don’t think this will be hard for my 3 year old to figure out. If you pull the remote trigger all the way, the cars go SO fast!! At one point, we were racing full speed, and the cars jumped over the track and started going on the floor. It was nice to see that these cars can be used anywhere. 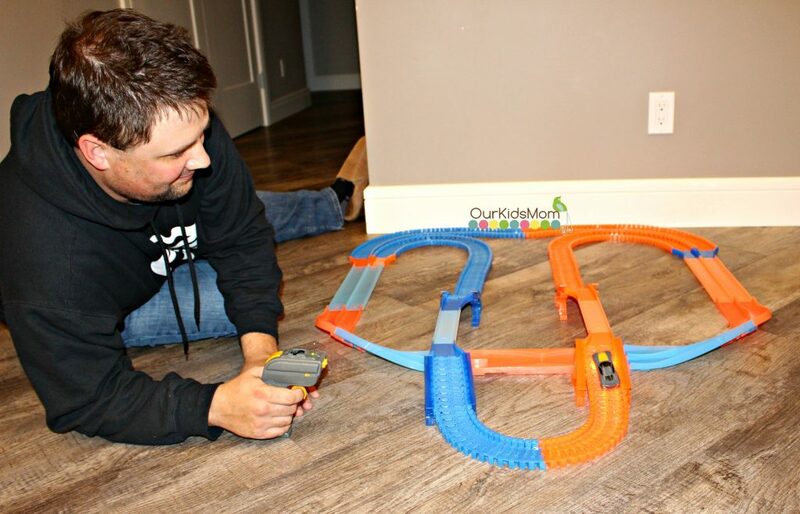 There are other tracks out there that are powered tracks, and the specific cars work only on those tracks, but these cars will drive even on the floors. My favorite feature was the glow in the dark aspect. The track actually glows, and I’m looking forward to giving Archer this for Christmas, as he will love to see it glow. As the cars drive around the track, they leave streaks that glow, and so it looks like they are leaving temporary, glowing tire marks on the track. I was really impressed to see this. 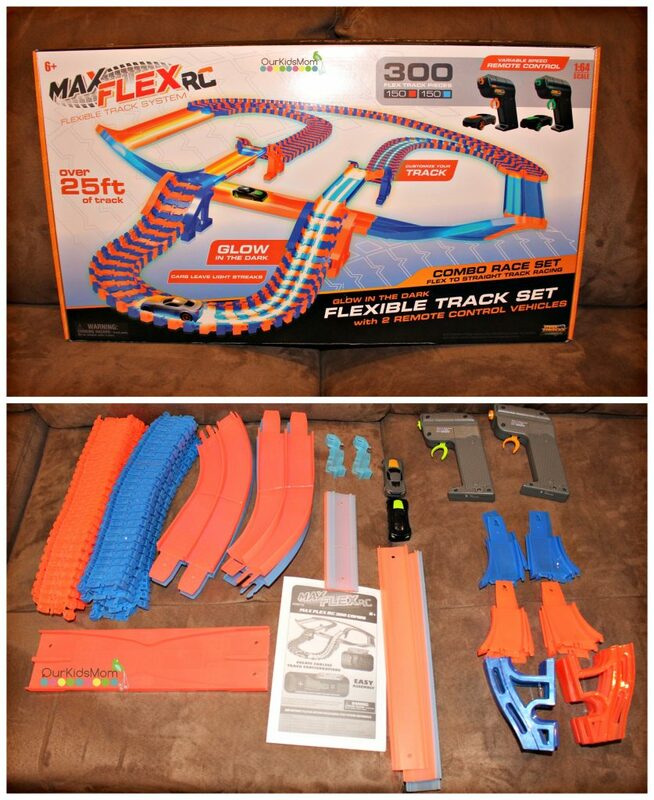 I am so excited to see Archer’s face when he opens the Max Flex 300 RC Glow In The Dark Flexible Track System. I know we will be spending hours building different tracks, and racing against each other. If you are looking for an exciting Christmas gift, head over to Skullduggery and get your Max Flex RC 300 track in time for the holidays!